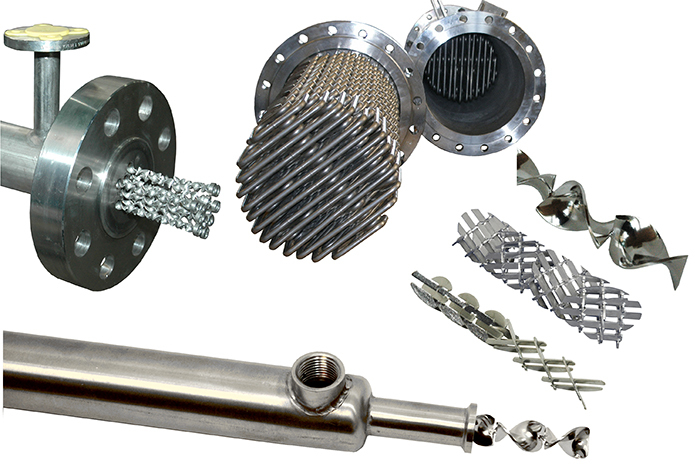 Figure #1: Static Mixer Heat Exchangers for heating and cooling viscous materials in various configurations: Monotube (bottom-left), Multi-tube (top-left), Cross-Tube (top-center) and various designs of mixing element inserts used in heat transfer (right side-center). StaMixCo manufactures static mixer heat exchangers for enhancing heat transfer in laminar flow applications. They are used for both the heating and cooling of viscous materials. A Monotube heat exchanger (photo bottom-left) is best for heating/cooling small flow rates of viscous material where a single tube filled with static mixing elements processes the entire flow rate. A Multi-Tube heat exchanger (photo top-left) is best for heating large flow rates of viscous material with multiple tubes in parallel. Each tube is filled with static mixing elements. A Cross-Tube heat exchanger (photo top-center) is best for cooling viscous materials which is fabricated from tubes bent to the shape of the high performance GX static mixing element crossing bar geometric structure as shown in Figure #4 below. The flow of high viscosity fluids in pipes and tubes is normally in the laminar flow regime. 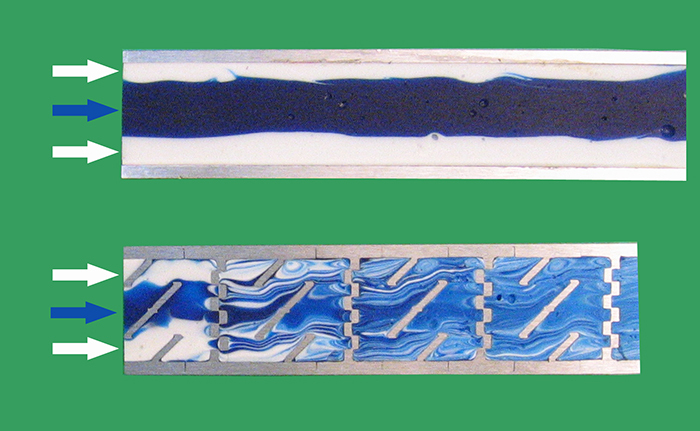 In the laminar flow regime, there is virtually no radial exchange/mixing of fluid at the wall and bulk fluid traveling in the center of the tube as shown in Figure #2 (top). When cooling or heating viscous materials in an empty tube, this laminar flow profile with no exchange of wall and bulk fluid material dramatically impedes heat transfer between the process fluid flowing inside the pipe and service fluid flowing outside the pipe. Static mixing elements, when inserted into a tube processing viscous materials will exchange wall and bulk fluid material as shown in Figure #2 (bottom) which results in enhancing heat transfer by a factor of 4 to 10 depending on the type of static mixing element insert used, the tube size, viscosity of the fluid and other fluid properties and process conditions. Compact volume with small space requirements. Plug flow characteristics ensure narrow residence time distribution of product flow in monotube configurations. Simultaneous heat transfer, mixing and reaction in monotube configurations. There are four (4) fundamental types of static mixing element geometric structures that are used for enhancing heat transfer in laminar flow applications. 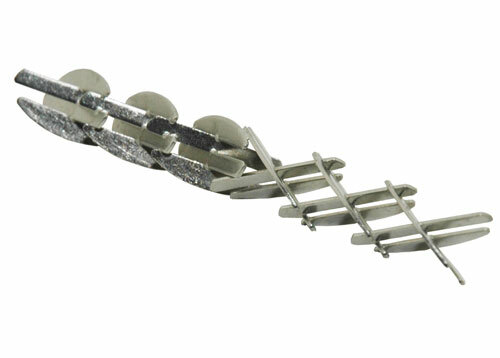 Each design has specific advantages and disadvantages depending on process requirements. They are described below. Figure #3: Type HT Helical Twist Medium Performance static mixing element structure. 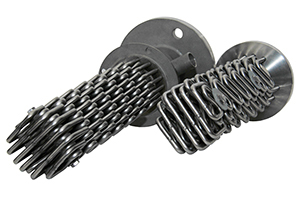 The Medium Performance Type HT helical twist static mixing element structure with alternating right-left bowtie twists will generally be the most cost effective heat exchanger mixing element insert with tube sizes of 1” diameter and smaller. 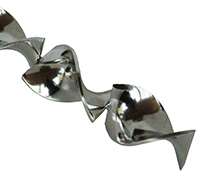 It exhibits a low pressure drop of ~6 times that of flow in an empty pipe. The HT mixing element structure in 1” diameter and smaller tubes is used in both Monotube and Multi-Tube heat exchanger configurations. 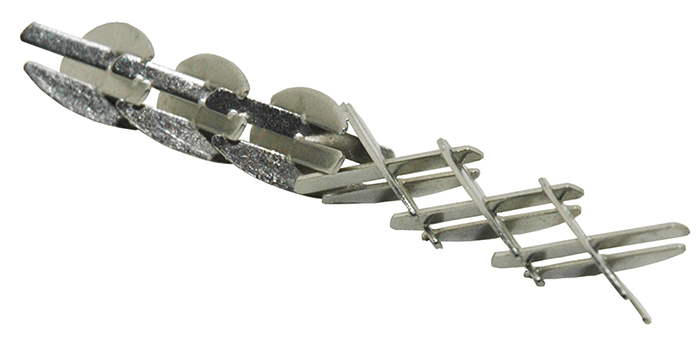 It is generally limited to applications requiring the heating of viscous materials. It has limited capabilities in cooling viscous materials when the viscosity of the process fluid dramatically increases with decreasing temperature. Figure #4: Type GX High Performance static mixing element structure. The High Performance Type GX static mixing element structure creates high heat transfer rates in a short length and is capable of processing materials with large differences in viscosity. It is used as a heat exchanger insert in the 1”-2” Diameter tubing size range and exhibits high pressure drops of ~36 times that of an empty pipe. For 1” diameter and smaller tubing size, the Type HT static mixer (Figure #3) is best. The Type GX static mixer is used only when the capabilities of the Type HT static mixer are exceeded. The GX mixing element structure in the 1”-2” diameter size range is used in both Monotube and Multi-Tube heat exchanger configurations for both the heating and cooling of viscous materials. The Medium Performance Type GXL static mixing element structure exhibits the general heat transfer and pressure drop characteristics of the Type HT static mixers structure (Figure #3) but has better high-low viscosity mixing capabilities and is able to exchange wall and bulk fluid material regardless of diameter. It is generally used in 3” diameter and larger pipe sizes in reactor and other polymer transfer pipe applications where it is desired to maintain temperature at very low pressure drop while mixing the process fluid with good exchange of wall and bulk fluid material. The Type GXL mixing element structure has the same fundamental X-Grid crossing bar structure of the GX static mixer (Figure #4), but is a more open structure with a gentler angle of the mixing plates relative to the pipe axis. The GX-L design is generally used in 3” diameter and larger monotube heat exchanger configurations to maintain process fluid temperature at low pressure drop while mixing wall and bulk fluid material. 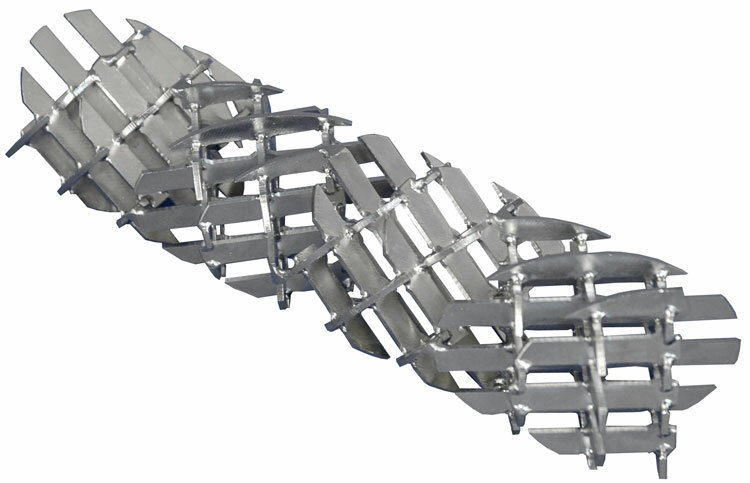 The High Performance Cross-Tube Heat Exchanger is fabricated of bent tubes that mimic the high performance GX static mixer structure (Figure #4). The process fluid flows outside the bent tubes and the service fluid flows inside the bent tubes. 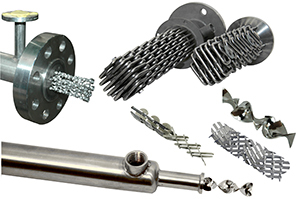 The Cross-Tube bundle is used in a monotube heat exchanger configuration in sizes of 4” diameter and much larger and provides very high heat transfer surface areas of 15-45 ft2/ft3 (50-150 m2/m3) at low pressure drop. The Cross-Tube design is used only when the capabilities of the Type HT, GX and GXL (Figures 3, 4 and 5) static mixing structures are exceeded. It is most often used in the cooling of viscous materials when the viscosity of the process fluid dramatically increases with decreasing temperature. Because of its monotube design and X-Grid geometric structure, fluid maldistrubution as witnessed in Multi-Tube heat exchanges with parallel tubes is eliminated. The Cross-Tube design is also used as a polymerization reactor when simultaneous mixing, reaction and plug flow characteristics are required along with heating/cooling of the reacting materials.